You have to download it first from Google Play Store and then installed completely. After that, you can open it easily on your Android. After Mobcrush is completely installed on your Android mobile, you need to create an account first. Then, you may also link your Twitter or Facebook account to share it. The next step to stream games on Mobcrush on Android is to go to Settings. Then, select the input devices for the microphone, camera, and screen. Now, you can choose what to stream. If you want to stream games, you can select the title and game available on the list on Mobcrush. Before starting streaming, it will be better for you to test it first. In this step, you should try a few streams to make sure that it can work well. After you make sure that it can work well, now you can start streaming including games. You can stream what you want based on your desire. That is all the steps how to live stream using Mobcrush on Android. 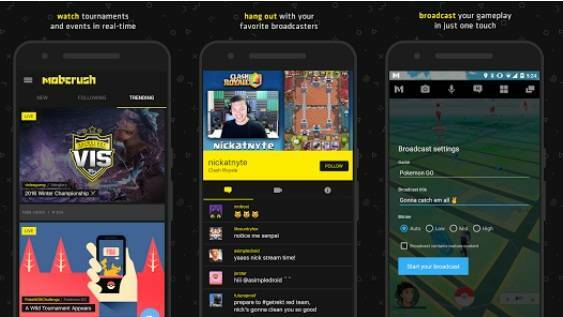 You cannot only stream games but you can also chat, share, etc because Mobcrush comes with many interesting features. So, you must consider downloading and installing it on your own Android.